The European Parliament Working Group on Antisemitism (WGAS) held a meeting on November 16, 2016 under the chairmanship of MEP Juan Fernando Lopez Aguilar (S&D, Spain). The theme of the discussion was ‘Youth Voices: Challenges, Opportunities and an Uncertain Future’. Benjamin Fischer, President of the European Union of Jewish Students, Josh Seitler, President of the Union of Jewish Students of the UK and Ireland, and Nethanel Cohen-Selal, representing the French Union of Jewish Students shared with Members of the European Parliament and other participants their experiences as young Jewish leaders as well as their expectations and concerns in light of the rising antisemitism and anti-Zionism in schools and university campuses across Europe. MEP Miltiadis Kyrkos (S&D, Greece) delivered an opening address in which he gave an overview of antisemitic incidents that were recorded in the EU member states in the last six months. He explained that antisemitic acts are not reported in various countries due to a number of reasons, including the lack of trust in national authorities and law enforcement agencies and lack of proper reporting tools. MEP Kyrkos called for the adoption of a working definition of antisemitism and for efficient recording and law enforcement measures throughout the EU. MEP Kyrkos stressed that antisemitism is very much alive in schools and universities across Europe, these sacred places where students are supposed to be taught about tolerance and respect. With regard to antisemitic hate-speech online, MEP Kyrkos commended the Code of Conduct agreed between the European Commission and major IT companies, but urged MEPs to put pressure on the Commission to follow up on it and make sure the agreed steps are implemented. He urged member states to be vigilant in the fight against antisemitism and raise efforts not only to stop social exclusion but also to combat the rising of extremism across Europe. The invited speakers detailed on how student activism works in their respective countries and organisations, and gave an overview of the projects they carry out in order to fight discrimination, ignorance, deception (in particular with regard to the BDS movement) and impunity. In their activities a great value is placed on cross-community work and building up coalitions, thus enabling Jewish students to speak out not only for the Jewish community, but also for other minorities and for the society as a whole. 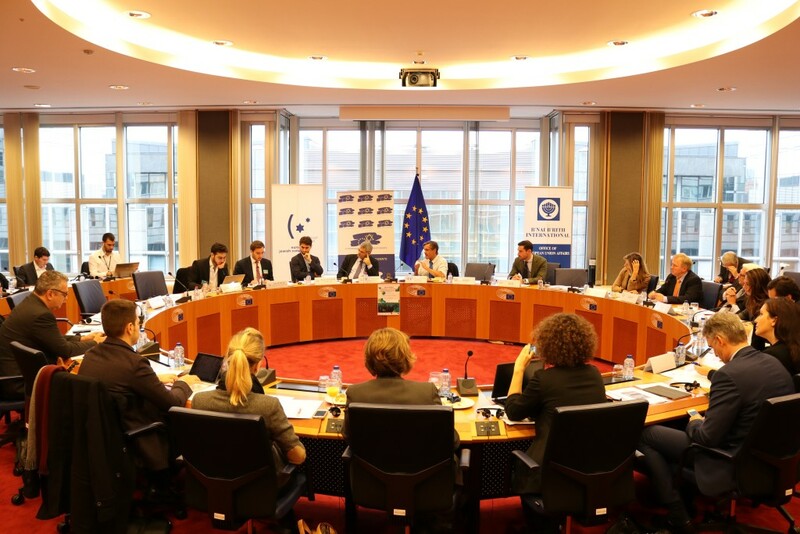 Following their address, all three speakers had an active exchange with MEPs where they provided examples of how they personally encountered or observed antisemitism and voiced their concerns. In her intervention MEP Frédérique Ries (ALDE, Belgium) called for more MEPs to take part in the activities of the WGAS. MEP Bas Belder (ECR, the Netherlands) said that the key role in the fight against antisemitism lies on non-Jews and urged the society to be courageous and to change the attitude of bystanders. Arne Gericke (ECR, Germany) advised on enhancing the interaction between Jewish and Christian congregations with a focus on the Protestant churches. In his closing remarks WGAS Chair MEP Aguilar brought attention to the fact that antisemitism today is often disguised under the cover of the criticism of the State of Israel. He also stressed the importance of bringing the intergenerational aspect into the discussions of the WGAS and mentioned that today’s youth has the responsibility of telling the story of the Holocaust to future generations. Ariella Woitchik, Director of Legal and Public Affairs of the European Jewish Congress, thanked the invited speakers for their participation, for their excellent work and for being proud Jews and vocal activists who address current challenge with passion, determination and optimism. She also expressed EJC’s gratitude to the Chair and all MEPs present for their constant support, with special thanks to MEP Kyrkos for his initiative to bring youth voices to the European Parliament.